The director of Assassin's Creed: Brotherhood said that the studio was in the dark for the first game but that the team has finally hit their stride. Patrick Plourde, game director of Brotherhood, said that the team has begun "to master the language of Assassin's Creed." At first, Ubisoft Montreal wasn't sure how to create a fun open world game in that universe and Plourde admitted that creating the first Assassin's Creed was like "walking in the dark." Now, with Brotherhood, Plourde thinks that he could set a Creed game anywhere and in any time period, including modern day. Working on the first Assassin's Creed was "an unsure experiment" that was more about "opening doors to see where they lead" rather than keeping to a strict design. By the time the sequel rolled around, Ubisoft had discovered what the series was all about. "With AC2, especially in the last six months we realised 'this is it.' We captured a genie and put it in a bottle," said Plourde. 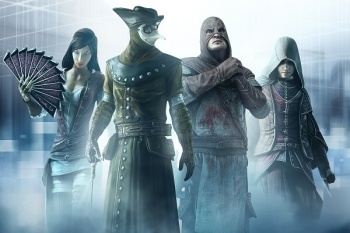 "For Brotherhood we've got that knowledge and [we're] starting to master the language of Assassin's Creed. There are a lot of possibilities." Plourde then moved on to where the franchise might go next. "Although the franchise is in a way stuck with the present - which is the final card that will always be there - other than that there are limitless possibilities with the brand." "I don't think a game is a finished project," Plourde said. "You have linear experiences like BioShock and you can say 'this is perfect' and then add stuff to make it better. With Assassin's there is a lot of stuff that can be worked on, it's a work in progress thing that you can experiment with. "It's super-liberating as a creator to be able to try wild stuff. There's always the possibility of changing the time period. You can keep the same core but because you've changed the setting you can do things like have firearms, have Leonardo Da Vinci." I'm interested to see where the franchise goes next, honestly. After hearing that Assassin's Creed was originally set in Mexico during the Mayan empire, I keep thinking about what such a game would be like. Ezio meets Apocalypto? Sign me up.